No traditional ceremony in India can match the grandeur and majesty of Rajasthani weddings. This is probably why many foreign couples get married in Rajasthan. Many rites and rituals, traditions and festivities make up the Indian weddings . This also includes dozens of small customs passed from generation to generation. We will help you prepare for your wedding in all aspects like religious ceremony, selection of traditional dresses for bride and groom, food and festive in order to be closer to Indian weddings. Henna ceremony, make-up session, tailor for saris, procession with elephants, horses, camels, musicians, dancers. Everything will be done to ensure that every moment is magical. Surrealist palaces, impressive forts, picturesque lakes, hills and glistening dunes, Rajasthan allows couples to get married in the most romantic way possible in a breathtaking frame. Any of the places of the ceremony like palaces or charming desert of golden sand, weddings in Rajasthan leave an endless note of happiness on guests. For a more romantic touch, the " Heritage hotels " are ready to welcome you and make your wedding unforgettable. There are many enchanting destinations to celebrate this event so specially. 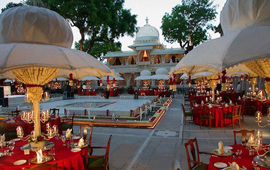 Udaipur "White City of Lakes", Jaipur "the pink city" and Jodhpur the "blue city" are among the most popular destinations, while Jaisalmer "Golden City" is an ideal destination for weddings near the desert.